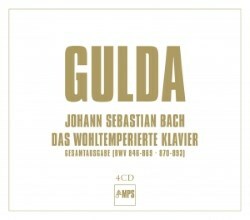 When Friedrich Gulda’s Well-Tempered Clavier originally appeared it was on five LPs, though with a little bit of juggling between the two books on disc 2 it can fit four CDs with ease. These recordings have also been previously available via the Philips label as a box set and on Decca as two ‘Duo’ sets. Unfortunately I don’t have these pressings to hand, but one of the attractions of this new edition is producer Thorsten Wyk’s approach, “to preserve the original sound aesthetics of the MPS recordings and not, as in previous reissues, to alter the dynamics and volume profiles.” This is a neutral transfer direct from the original master tapes, so as close as we are likely to get to ‘perfection’ in terms of Gulda’s recording. There is tape hiss audible with quieter pieces and the volume raised, but audiophiles will find this reassuring rather than annoying. An important aspect of these recording sessions is that the microphone was positioned above the piano, “directly over the strings, giving the recordings a very direct sound, low in resonance.” There is indeed no relaxing bath of acoustic bloom in this recording, and as a result the playing can at times sound almost confrontational. One of Gulda’s interpretative ideas was to “bring out on a modern concert piano the harpsichord, clavichord or organ character of the individual pieces.” Trying to identify which might be which is a game you can play with yourself or friends, but there is no handy listing guide so arguments may remain inconclusive. In any case, Gulda is happy at times to soften the sound using the una corda pedal, which approaches the gentler clavichord. A staccato touch can suggest harpsichord, with at times quite a French feel. Dynamic differences between pieces can be considerable, so we’re kept awake or, if driving, twiddling the volume knob. The piano sound is bright – just short of being ‘hard’, but while this is not the usual perspective it is one to which you can easily become accustomed. As with many piano performances, tempi can at times slow down to the ruminative, such as the prelude of BWV 853. I rather like these pensive qualities and find myself dreaming along with the performer, lost in timelessness. Less appealing is the more clattering glare of BWV 861 which I presume is a more ‘organ’ tinted performance, at least judging on the use of the pedal. In other words, you have to take the rough with the smooth – admittedly a subjective conclusion since what I find aversive may be an exciting treat for others. There are indeed some exciting moments to be had as well, for instance the prelude of BWV 864 which comes in at a bracing 50 seconds. There is a slight difference between Book I and Book II in terms of recording quality. Book II sounds just a little more nasal to my ears, though this is a marginal effect. These CDs are very nicely presented in deluxe foldout book-form, the booklet with its original artwork holding texts in German and English on the recordings, Gulda’s own comments on The Well-Tempered Clavier and Peter Schinnerling’s notes from 1972 and ’73. This is a unique recording and as such doesn’t really bear direct comparison with other versions of the same work. My favourite piano recordings of Das Wohltemperierte Klavier vacillate between Angela Hewitt on Hyperion, Roger Woodward on Celestial Harmonies, and sundry other recordings depending on my mood, but including Glenn Gould on Sony Classics, Samuel Feinberg on Pristine Audio, Peter Hill on Delphian … There are of course many others of equal distinction. For some this will have the feel of something legendary, but this kind of aura has more to do with one’s relationship to the original releases. Friedrich Gulda’s playing is special indeed, but can trade on extremes which are always likely to divide opinion. While relishing this as a personal and belated discovery I wouldn’t choose it as my one and only WTC, but who in the world can live with only one WTC?